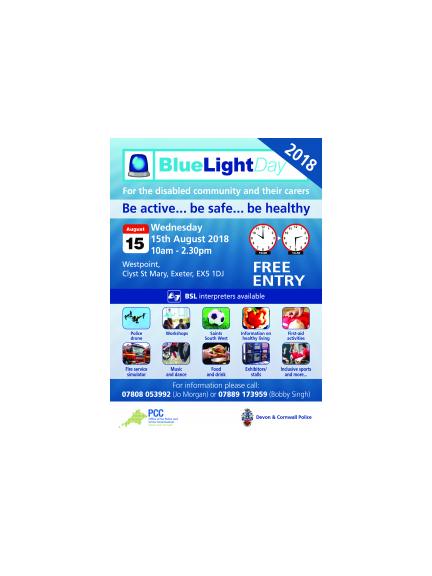 The Devon Blue Light Day invites all people with disabilities to experience a festival of activities on 15th August 2018. The event will be held at Westpoint Exeter. Supported by Devon and Cornwall Police and other public, private and charitable organisations, the theme of the day is ‘be Active, be Safe and be Healthy’. The event, in its third year in Exeter, aims to help people with disabilities keep safe and become more confident and independent in their community. It hopes to help break down any barriers that exist between disabled people and the emergency and wellbeing services and will allow more people to feel more comfortable in reporting hate crime and also addressing their health and wellbeing. It gives people with disabilities the opportunity to meet Devon’s emergency services. Additionally, it gives them a chance to say what they think about the services provided and identify ways that services can be improved if needed. Mid Devon District Council Private Sector Housing team will be attending to raise awareness of Disabled Facilities Grants and other assistance available for adaptations and repairs, to enable anyone to live in a safe and healthy home. A number of supporting organisations from Devon will be on site to give out information about their services. These include The Emergency Services, NHS, educational and voluntary organisations. The Blue Light day is a fun and inclusive way for people to work together to ensure that organisations who provide services deliver their services in line with the country’s equality and diversity requirements. This event will help to break down barriers.